2. Multiple time modes: 5+2 / 6+1 / 7 days. 3. The screen of the thermostat is very easy to clean. Its stylish appearance might fits your house perfectly. 4. 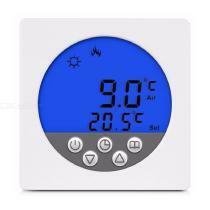 Using flame resistance material, the thermostat is safe and reliable for daily use. Suitable for electric heating equipment and water heating system of electric heating. 5. Users are free to choose Manual mode or full automatic mode for different purposes. 6. With a built-in CR1220 3V battery, the thermostat could continue to run even if power was cut off. 7. This thermostat adopts the latest single-chip computer control technology, which has high reliability and powerful anti-jamming. 8. According to the preset temperature, the thermostat will start or stop the specified object automatically. (valve, floor heating, the heating wall, electric heater, etc). 9. With this high-efficiency and energy-saving thermostat, not only can it drive down home energy costs, but also provide you comfortable living environment.